Our first and foremost pride in our fleet. We have enriched the line of vehicles offered to customers' choice with premier minivans all in spotless condition. Hiring any model, you are ensured against staying half the way. Book Mercedes Viano or V class once you arrive in Frankfurt with up to eight colleagues. 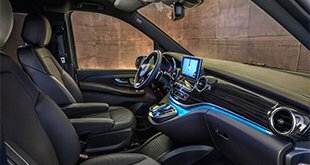 These models are equipped with all the amenities you may expect from a premium vehicle including central heating, air conditioning, reading lights, advanced audio system, carpeting, etc. Mercedes Sprinter, meanwhile, is a perfect variant for larger groups composed of two dozens of people. Booking this vehicle, all of you will drive safely and comfortably. The model provides smooth driving on all roads! What 8Rental car supplier can't but feel proud of is its amazing staff of workers. Starting from CS operators and ending with drivers, all of us are determined to provide excellent services to you! Our chauffeurs are licensed, experienced and responsible. They are aware of all main roads in the city and will take your group in any direction necessary. Just sit back and relax, make final notes or discuss your upcoming meetings while being driven to your destination. By the way, our chauffeurs speak not only German but also a series of other languages. Hence, you are free to choose the driver you can contact within your native language. 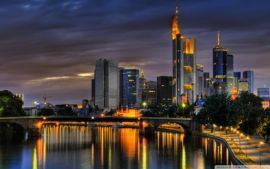 Frankfurt is a significant financial and industrial destination in entire Europe. And even though most of the travelers here are on business, they should, by all means, find time to explore this beautiful city! Besides the famous Opera House, the pedestrian shopping street, impressive skyscrapers, multiple parks, the Main River, and some entertainment facilities, there is still much to explore and admire here. 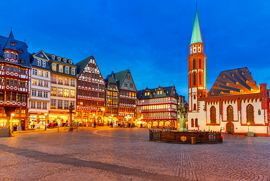 So, if you are here on business and have very little time to spend on your own, rent a chauffeur driven minibus in Frankfurt and tell driver take you to the city's most important sights. 8Rental car rental service offers a path for group travelers who have neither much time nor much money to spend in the city. The tour includes visiting Cathedral of St. Bartholomew, The Hauptwache, Old Nicholas Church, Sachsenhausen. Seeing all these landmarks of Frankfurt, you won't spend a Euro, yet will feel the "breath" of the city!